Utilize various forms of lighting such as downlighting and uplighting to show off the unique architecture of your home or office building. This will enhance your curb appeal, deter unwanted guests and illuminate the best outdoor features of your home. For maximum results, highlight columns, archways, front entries, and stone facades. 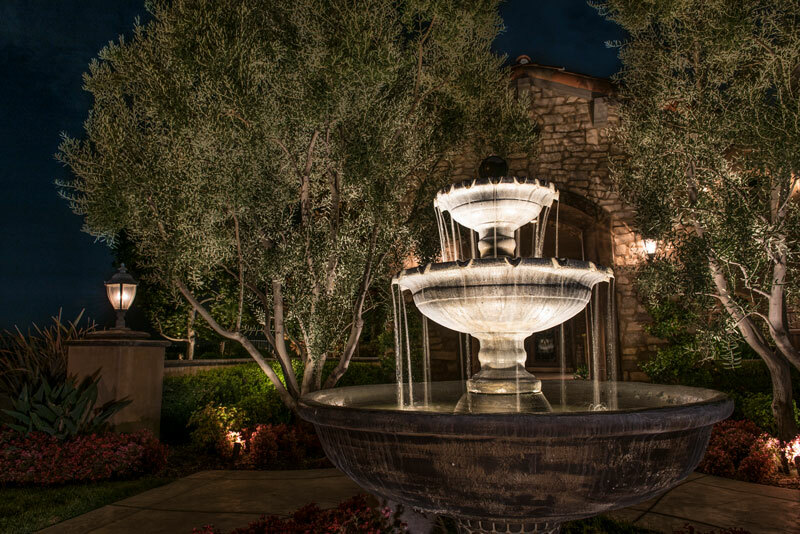 Whether it’s a fountain or a bird bath, make sure your water features get the attention they deserve with lighting that enhances their look at night. If you’ve invested in a great water feature for your home, make sure it can always be seen and enjoyed! Shining a light on your water feature will not only make it a beautiful attraction with a soothing ambiance, it will also make it safer to enjoy. You shouldn’t have to be worried about tripping while you walk through your landscape at night. Create a beautiful setting for you and your guests with walkway lighting that enhances the path and produces a memorable look. There are a variety of lighting fixtures that can be used along your walkway. The typical path light is a simple yet effective option. Additionally, there are alternatives to path lights such as custom designed bollards that reflect patterns of light onto the hardscapes. 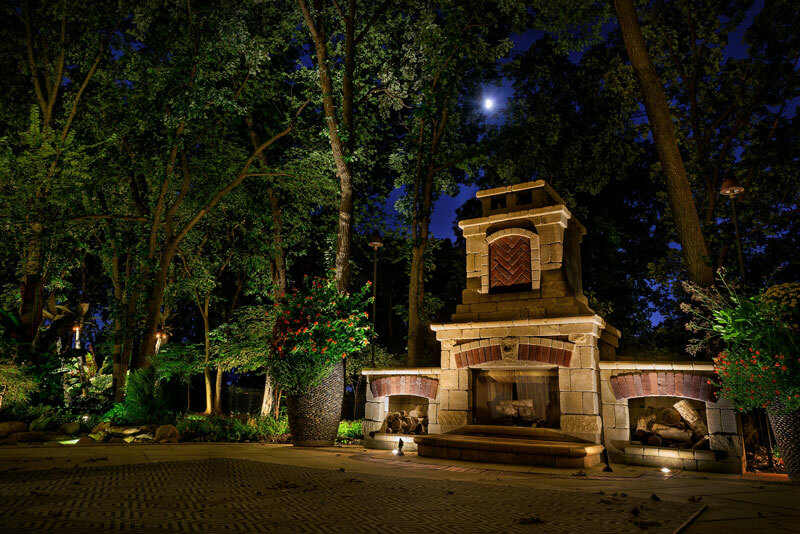 Create a welcoming atmosphere and set the mood for your outdoor living area with landscape lighting. Outdoor kitchens, patios, or dining spaces require ample lighting to ensure you can see what you’re cooking. You and your guests will be able to see the food on your plates and each other while enjoying your outdoor living experience. 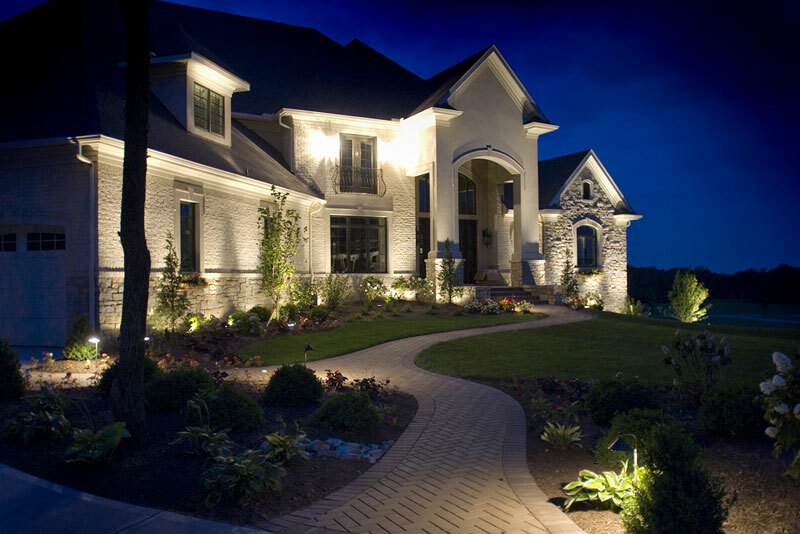 A Landscape Lighting Designer will be able to work with you to create just the right amount of illumination for your space. 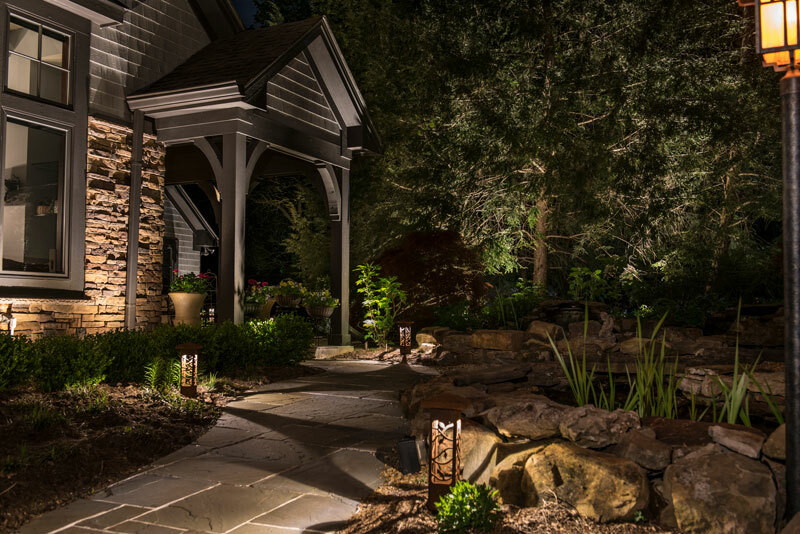 Bistro lights and tiki torch path lights are options for a soft glow without glare. Pool lighting will provide safety and a custom experience in your backyard. Try color-changing lights to tailor your poolscape for a mood or theme. Choose blue for a peaceful late-night swim or orange hues for a fun-filled event. If the lights in your pool don’t do enough to create the feel you’re going for, enhance the look of your pool area with moonlighting, tree lights, or ground recessed lights. Although you may think that a fireplace or fire pit will give off enough fire light to see by, it’s prudent to install lighting in the surrounding space for safety and added effect. Placing outdoor lighting in an area with a fire element will also show off the beauty of this landscape feature when it is not being used. Illuminate the stone work of your fireplace to create an elegant focal point in your yard or use lighting to play off of the shadows that plants and trees create in your space. Some of the most beautiful parts of any landscape are the trees. Trees are typically seen as an asset to any property. In fact, they are said to increase property value anywhere from $1,000 to $10,000. Whether it is their massive size or colorful leaves, tree lighting can focus attention on a tree’s high visual impact. Give them center stage with proper lighting that filters through the leaves and creates a beautiful look any time of year. It’s all about first impressions, right? 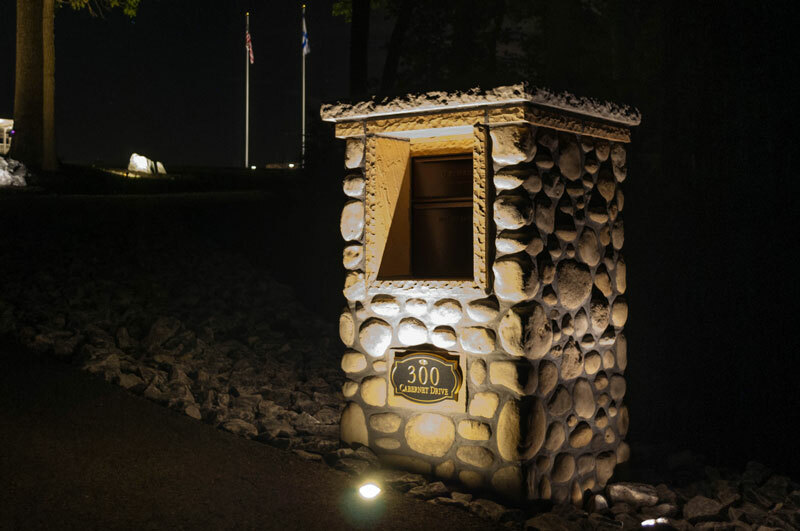 If you’ve got a great mailbox or building number sign, help it stand out with a little bit of light! Guests pulling up or even passersby will be impressed by the attention to detail you’ve given to the entrance of your property. 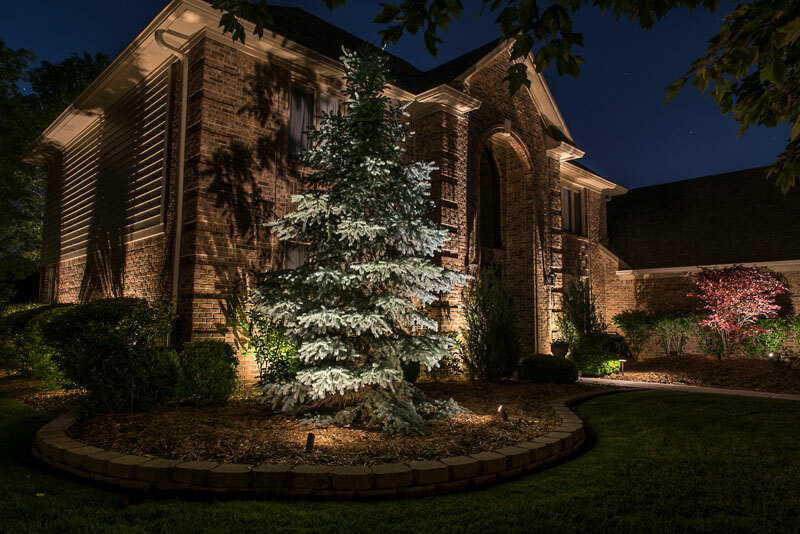 If you would like more information about shining a light on the best features of your landscape, contact Lighthouse Outdoor Lighting. 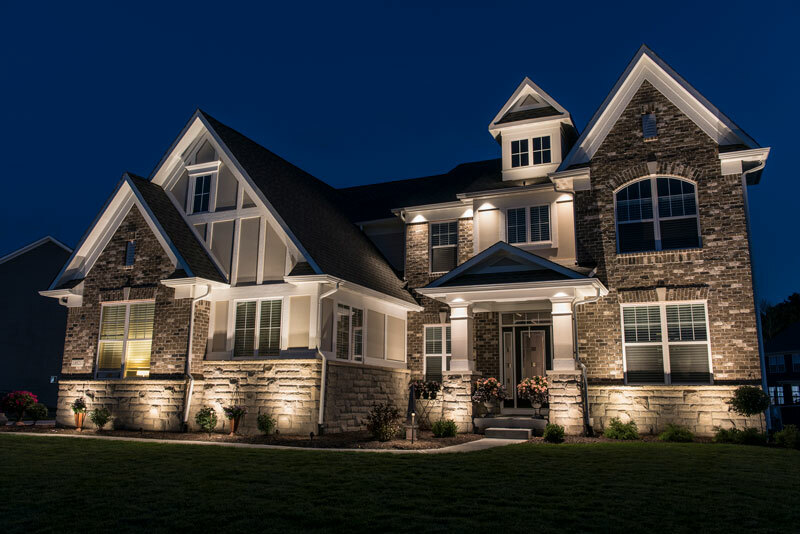 We will help you customize your lighting design to enhance your property with light.